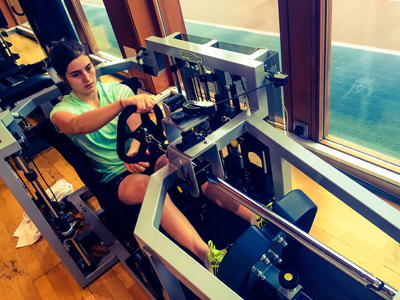 Since entering her first karting competition at the age of nine, Tatiana Calderón has been racing. Now twenty-four, the Columbia-born driver trains an average of twenty hours a week as she prepares for her 2017 season as a development driver for the Switzerland-based Sauber F1 Team. Recently, Omegawave had an opportunity to speak with Calderón about her training methods and approach. Omegawave: How long have you been using Omegawave Individual? Tatiana Calderón: Approximately 1 year. OW: How have you have integrated Omegawave into your weekly routine? Where do you measure yourself, how many times do you measure per week, and how do you communicate with your coach about what to do each day? TC: I always measure once or twice a day to determine the type of training I can do. The most common measurement time is usually in the morning. This allows me to prepare myself for the day’s training. Depending on the results, i.e. my readiness, my coach adjusts the training to get the most out of it. He automatically sees my results remotely on his Coach app. To give you an example—if we were planning to train explosive strength, but my CNS values ​​are low, we would change the exercise modality and, for example, do something different like cardiovascular exercise. OW: In what areas do you use the information? Do you apply the results just to determine fitness loads, or do you also use it to optimize your travel schedule and racing-specific workouts? TC: I use it mostly for physical preparation training, because on the racing days I cannot change much even if I’ve received sub-optimal readiness results. However, when this has happened I have still been able to do more extensive activation work before I get into the car and thus be better prepared to do my sport-specific work. After the training, we also measure again ​​to better understand what type of recovery is more suited to my current condition. OW: Have you seen a relationship between the results from Omegawave and your physical ability, or physical performance? TC: Yes, I definitely have. When I had low CNS readiness and subsequently did some reaction work with lights, for example, I noticed that I was much slower in my reactions than normally. Thus, nowadays when I get these types of values we either change the training type or try to do some activation work to stimulate my nervous system back to normal. So, Omegawave has helped me understand what is my optimal CNS activation range vis-à-vis my reaction speed, and thanks to this knowledge I have been able to do a better job at optimizing my readiness for competition. OW: What kind of changes have you made to your workouts and to your training philosophy thanks to this information? TC: It has helped me to know myself better, and it has helped me to understand where I perform at a higher level. This has been the most important thing to find out because it helps me to prepare myself to reach an adequate level of readiness, allowing me to give my 100% in competition. OW: Was that change difficult? TC: No, not at all. In fact, it has been a great help to learn more about myself as an athlete. OW: Have training load volumes and intensities changed a lot since incorporating Omegawave into the weekly schedule? TC: In my case, they have not changed much. What has changed is timing—that is, finding the best time to train certain qualities. OW: In the different categories of motor sports, the cars receive a great deal of attention and care so that they are always at their best performance level before a competition. In your opinion, do the pilots also receive this much attention and care, or are there areas that can still be improved? TC: I think there is a lot to improve, because there are very few people specializing in the development of pilots. While it is a sport that depends a lot on the car, it is amazing everything that the driver can bring and things that can be changed and adapted so that car and driver give their maximum. In the end, it is a combination of factors that bring about the best results. So, even if the car is performing very well but the driver is not, the overall results will not be optimal. OW: What has been your biggest take away since starting to use Omegawave? TC: It has taught me to know myself better and to understand the level of readiness I need to perform at my best. Additionally, this information has made me more appreciative of the recovery periods, so that I can be better prepared before the competition. So, all in all, I think Omegawave allows you to be more effective with your training and recovery process. It has also opened my eyes to the idea that there is an optimal time for each type of training, depending on your individual readiness.